Yu et al showed that podosomes, which are usually formed by either macrophages or transformed cells, can also be formed by normal fibroblasts on fluid matrix devoid of any traction force. This was mediated by the phosphoinositide 3-kinase (PI3K) and PIP3 in a FAK/PYK2-dependent manner. These findings were published in Cell Reports in 2013. The left panel shows fluid RGD-supported lipid bilayer membrane on which cells are not able to generate traction forces and develop podosomes within 45 minutes after plating. This is mediated by the phosphoinositide 3-kinase (PI3K) and PIP3 in a FAK/PYK2-dependent and RhoA independent manner. The right panel shows a cell plated on rigid RGD-supported lipid bilayer membrane generating traction forces and forming focal adhesions and stress fibers. The RhoA levels in these cells are high. Podosomes are ring-like adhesions which are usually put forth by migratory cells such as macrophages, metastatic cancer cells as well as transformed fibroblast cells. 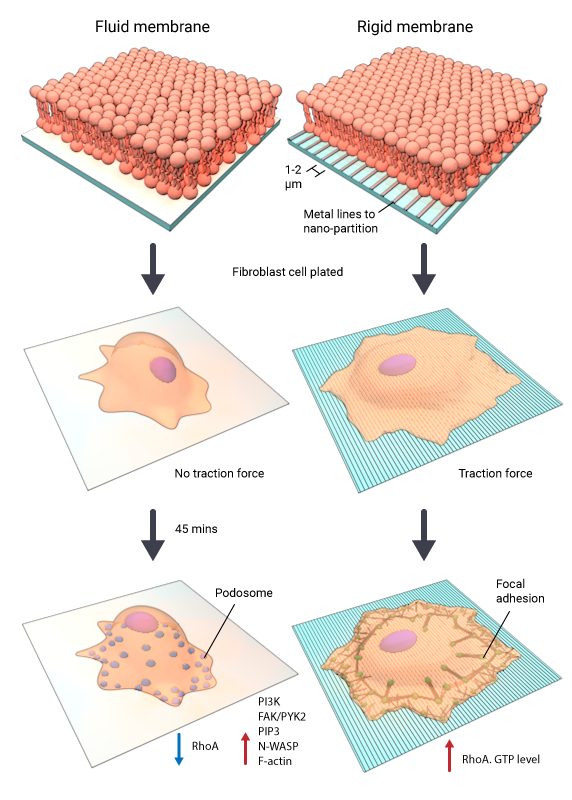 This study shows that normal fibroblast cells can also form podosomes in the absence of traction forces on a fluid matrix. The main highlight of this study is the differential influence of substrate rigidity or fluidity on the nature of adhesion structures formed. Precisely, normal fibroblasts form podosome-like adhesions on fluid surfaces whereas they form focal adhesions on rigid surfaces. The study employed mobile Arg-Gly-Asp peptide (RGD) ligands on nanopatterned supported lipid membranes to analyze the effect of traction forces on cell-matrix adhesions. The mobility of these membranes was restricted using nanofabricated metal partitions closely spaced together (1-4µm). At 1 and 2 µm spacing, the membranes displayed rigidity and cells formed stable focal adhesions. 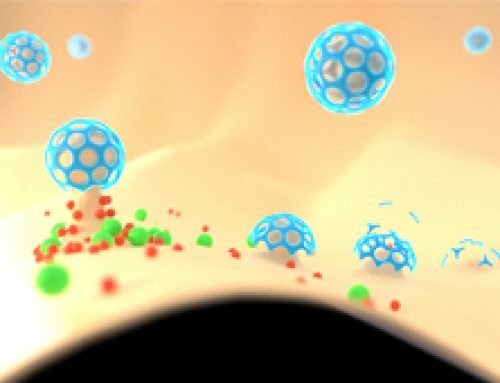 Podosomes developed on continuous films of RGD membranes that were laterally mobile, and on RGD membranes nano-partitioned by larger spacing of 4µm, that rendered more fluidity than rigidity. The activation of PI3K and the generation of PIP3 in the absence of traction forces in fluid membranes underlie the formation of podosomes on fluid membranes. How do podosomes functionally differ from focal adhesions? Podosomes are actin-rich, adhesive structures that are present at the ventral surface of cells of the monocytic myeloid lineage, stimulated endothelial cells, and cultured Src-transformed cancer cells. These structures are not limited to the cell periphery, but do exhibit a polarized distribution pattern in migrating cells, localizing to the front at the border between the lamellipodium and the lamellum. Structurally, the podosome is characterized by two main features – an actin core and a ring complex. The actin core contains several coordinators of actin nucleation, namely the Arp2/3 complex and WASP proximal to the plasma membrane and cortactin or HS-1 (hematopoietic lineage cell-specific protein 1) more distally. Further to the dense actin network forming the core, actin filaments emanate radially from the actin core to the plasma membrane and between individual podosomes. The ring complex comprises integrins and integrin-associated proteins, such as paxillin and serves to connect cell surface integrins with the cytoskeleton. Originally thought to be a round structure, recent advances in bioimaging have shown the ring complex to have a polygonal shape. In general, the podosome structure is no greater than approximately 0.5 μm in width and 1 μm in depth. The lifetime of this structure is far shorter than that of focal adhesions, lasting only a few minutes. Focal adhesions are integrin-containing, multi-protein structures that form mechanical links between intracellular actin bundles and the extracellular matrix or substrate in many cell types. Focal adhesions contain high levels of vinculin, talin, paxillin, zyxin, α-actinin, VASP, FAK, phosphotyrosine proteins, integrin αVβ3 and actopaxin. They are commonly found at the ventral surface of cells in 2-dimensional tissue culture and can be envisioned as the feet of the cell. Focal adhesions act as molecular clutches that provide grip to the substrate for the lamellipodium to protrude forward during motility. Focal adhesion formation is initiated by receptor-matrix binding along the cell periphery at the leading edge. These early complexes, referred to as “nascent adhesions”, initially attach to actin filaments via adaptor proteins such as talin. Growing adhesions increase the traction on the substrate, slow down the actin retrograde flow, aid force transduction along the attached actin bundles and in turn, reinforce the linkage to actin by recruitment of additional scaffolding and signaling components. Further, traction forces exerted by actomyosin contractions and resulting signal transduction events such as phosphorylation of components by focal adhesion kinase promote adhesion maturation and the formation of stress fibers in the lamellum. Both focal adhesions and podosomes are intimately involved in cell motility, with podosomes specifically implicated in cell invasion. Invasiveness is achieved through the secretion of matrix metalloproteinases (MMPs) from the core of podosomes, which degrade the extracellular matrix (ECM). Non-transformed fibroblasts (RPTPα+/+ mouse embryonic fibroblasts and REF52 rat fibroblasts) formed podosome-like structures on mobile RGD membranes. Podosome-like structure formation in non-transformed fibroblasts was initiated by RGD-integrin clusters similar to focal adhesion formation by the nucleation of micrometer sized nascent adhesion clusters. However, unlike focal adhesions, these RGD-integrin clusters on fluid membrane were not interconnected by actin stress fibers and formed podosomes after 45 minutes of initial adhesion. The podosome-like structures formed by non-transformed fibroblasts on fluid membranes were enriched for characteristic markers of classic podosomes such as F-actin, Arp2/Arp3, WIP and N-WASP. Podosome formation was dependent on Arp2/Arp3 but not on formin. Also myosin-II was not enriched at the podosomes. Last but not the least, the podosome-like structures were protrusive and the core was depleted of RGD akin to classic podosomes. Increasing the rigidity of RGD lipid membranes by nano-partitioning using metal lines (100nm line width and 5nm height) spaced 1-2 µm apart generated traction force and this suppressed podosome formation. The suppression of podosome formation could be reversed on a less rigid nano-partitioned RGD membrane (4µm spacing of metal lines). 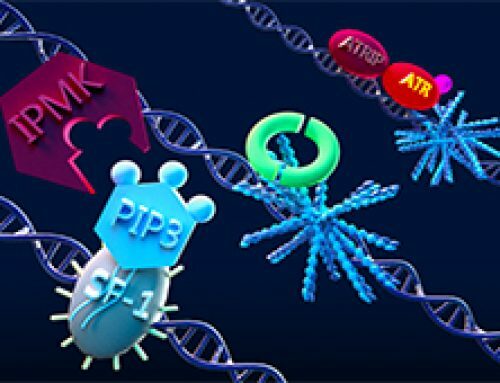 p85beta, the regulatory subunit of class 1A PI3K was recruited to pre-podosomal RGD clusters, causing an increase in PIP3 levels. This resulted in F-actin assembly, N-WASP recruitment and subsequent conversion of prepodosomal RGD-integrin clusters to podosomes on fluid RGD membranes. The recruitment of p85beta was regulated by the autophosphorylation by FAK/PYK2 kinase. Podosome formation by non-transformed fibroblast cells on fluid RGD membranes also coincided with low levels of RhoA-GTP. This was confirmed by experiments showing the recruitment of Rho GAP, ARAP3 at podosomes. This study employed RGD-supported lipid bilayer membranes to plate cells. These membranes were nano-partitioned by metal lines 100 nm in width and 5 nm in height with varying degree of spacing from 1-4µm, imparting different levels of rigidity to study the effect of traction force on cell-matrix adhesions. Live cell imaging to view cell-matrix adhesions were performed using inverted spinning-disk confocal microscope. Acquired images were analyzed by ImageJ software. 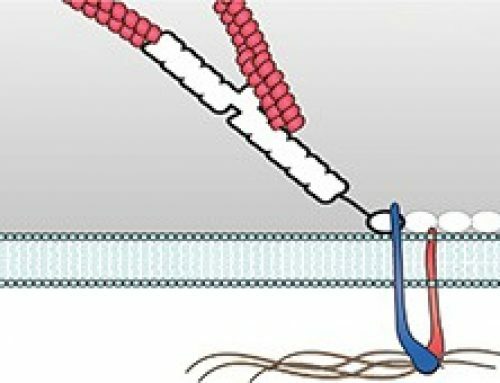 This study provides novel insights into how mechanosensing regulates the nature of cell-matrix adhesions.